From the cover depicting the crystal regulator "Regal" against a background photograph of the Ansonia Clock Company factory, this new edition of ANSONIA CLOCKS AND WATCHES (1998) is a spectacular book. Its 752 pages are crammed with 3061 illustrations depicting every single type of clock made by Ansonia as well as many of their additional products - side pieces, top ornaments, candlesticks, watches and more. The size and weight alone of this new edition indicates the great wealth of additional material that has been added to the 1989 edition. It is these additions that reflect Mr. Ly's attention to the types of information sought by the clock and watch collector. This book does not simply reproduce Ansonia catalogs. If it had done only that it would provide a valuable reference for the collector. But it is the extras, seen in few if any other collector guides, that make this a "must have" reference for collectors and libraries. What are these "extras?" 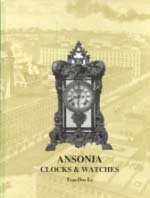 First, a complete, detailed history of the Ansonia Clock Company by noted horological expert Chris Bailey. This concise history is beautifully illustrated and heavily referenced. Photographs, many never before seen by this reviewer, show the men who dominated Ansonia's early history as well as the offices, sales rooms, and factory. Page 37 includes a table that will serve as a quick reference for dating Ansonia clocks and neatly unravels for the collector the names used by the company at various times in its history. Ly's nineteen-page introduction is the result of years spent discussing and collecting clocks. The beginning and seasoned collector both will benefit greatly from reading these important tips on buying and collecting clocks. A careful study of these pages, the cumulative knowledge of many noted collectors, will greatly enhance one's collecting experiences. The bulk of the text is divided into 48 sections that include all the types of clocks made by Ansonia, as well as brief sections on movements, movement parts, and electroliers. An extensive 49-page section is included on sidepieces, top ornaments and candlesticks. The final section illustrates watches made by Ansonia from 1894-1920. This section includes not only catalog illustrations but also photographs of actual watches owned by private collectors including, in many instances, the original shipping boxes and their labels! This attention to detail is repeated throughout the book. Many author/publishers would have been satisfied to reproduce catalog pages, but Mr. Ly goes beyond that. In many instances photographs of actual clocks are given next to their catalog illustrations. If variations appeared in a clock throughout its production history these are shown side-by-side, again with photographs of actual clocks. Close-ups of dials, movements, parts of movements, cases, case backs and marks on porcelain clocks are all shown. Details to consider when attempting to determine if a clock figure and base are a marriage are concisely presented. A wonderful section on crystal palace clocks begins with a history of these clocks by Chris Bailey including information on the Waterbury crystal palace clocks that will lay to rest much of the confusion about these clocks. Each page depicts Ly's wealth of knowledge about clock collecting and the things important to the collector. An extensive index by clock type and model name concludes the book. This index greatly aids the quick location of a specific model if a name is known. If the model name is not known the organization of the book by clock type, with an excellent table of contents, greatly facilitates the use of the book. This new edition is destined to become the classic reference on the Ansonia Clock Company and its products. The beginning collector may wonder if it is a worthwhile investment to purchase what to many will appear to be a very expensive book. I can honestly say yes and enthusiastically encourage the purchase. From my years spent researching information about Ansonia clocks I know that much information not previously published or scattered in many sources is cumulated in this one volume. This is one book I would encourage people to purchase for their own libraries. It will be money repaid many times over in coming years. Accompanying the book is a separate pamphlet listing the values of each item in the book. These values have been carefully determined from the input of many well-known collectors from various parts of the country. By using the format of a separate price guide Mr. Ly enables collector's to inexpensively update the value guide section without purchasing an entire new volume. The main text will serve as a reference for years to come. Those interested in values will be able to inexpensively purchase supplemental price information as it is updated. Soon after being asked to write this introduction to the second edition of Ansonia Clocks my memory served up a comment by Dr. Steve Petrucelli of the Adams Brown Company to the effect that Tran Duy Ly has single-handedly revolutionized the clock book business. The import of this statement cannot be under-emphasized and it is a great accomplishment that this revolution has been an ongoing and progressing refinement with the passage of time. Tran Duy Ly has greatly developed and advanced the principles of organization and pricing first set forth by the pioneers of clock reference books: Roy Ehrhardt with his two Clock Identification and Price-Guide books, and Andrew and Dalia Miller's Survey of American Calendar Clocks. First of Mr. Ly's books to make its appearance in 1984 was the softcover Clocks: A Guide to Identification and Prices. This inclusive and well-organized guide is still one of my favorite auction companions even though it is long out of print. In one book the collector could find most any mass-produced clock with detailed illustrations for determination of originality plus a trustworthy pricing reference. My third copy is in poor repair but remains handy for quick reference. Soon to follow were more ambitious projects involving specific manufacturers as well as an updated two volume general catalog of American clocks. Witness the profusion of publications from Mr. Ly and his Arlington Book Company for collectors and dealers alike: Seth Thomas Clocks and Movements (1985), Ansonia Clocks (1989), American Clocks Volume I (1989), Waterbury Clocks (1989), American Clocks Volume 2 (1991), Welch Clocks (1992), Calendar Clocks (1993), Longcase Clocks and Standing Regulators - Part 1: Machine-Made Clocks (1994), Seth Thomas Clocks and Movements - 2nd Edition (1995), Calendar Clocks 1997 Update-Featuring Previously Unpublished Photographs and Information (1997), Gustav Becker Clocks (1997), New Haven Clocks & Watches With a Special Section on New Haven Movements (1997), Gilbert Clocks (1998), and Ingraham Clocks & Watches (1998). And hence we have come full circle with the second edition of Ansonia Clocks found here. Tran Duy Ly, being the experienced and well-respected clock collector and editor-publisher that he is, has kept the best aspects of his previous works while managing to push the horological book industry forward with additional features in his latest publications. Thus, in this new Ansonia Clocks, timepieces from the clock company which have never been seen before in the earlier edition are described and depicted. Real photographs of clocks and their respective parts are abundant, clear, and detailed and have been added to the already massive number of original factory catalog illustrations. A large number of photos and specifications for movements are also included and referenced. Of much importance to many collectors will be the new, comprehensive, 47-page section "Side Pieces, Top Ornaments & Candlesticks" which will allow them among other things to name those clocks whose ornamentation has been exchanged. A national spectrum of the best-known collectors has provided input to this book and has shared their most treasured examples from the Ansonia Clock Company. Much effort has been devoted to realistic pricing suggestions by consulting both auction hammer prices as well as private transactions between the country's top experts; the fruit of such labor may be found in the supplementary price guide to this book. The price guides for this and other books by Tran Duy Ly are updated on a regular basis in an endeavor to keep current with price trends. As collecting has expanded and matured in the last two decades so have the efforts and interests of Tran Duy Ly. Accordingly, I am quite confident that you will enjoy this new addition to your library and share in the pride of Mr. Ly and his many qualified contributors. Be assured that when buyers and sellers discuss the exchange of an Ansonia clock, the text of reference will already be in your library.